When we see the Page of Wands, we see a youth with enormous excitement and curiosity for the world. He knows what to do, he has the passion to succeed, but due to his inexperience and maybe a little fear of the unknown, his ideas remain abstract. He identifies new worlds to explore, new opportunities he could take advantage of quite easily, and he is even gifted with the "big picture" vision needed to succeed. Even with all of this, he still has the tendency to either remain dormant, or get easily distracted with one idea after the other. If he doesn't learn to control this, it might be that he squanders the opportunities to advance himself. When you get the Page of Wands, it simply means something is within you, something that triggers you to make discoveries, indulge in investments or take the next advancement in life. When you get the Page of Wands, it simply means something is within you, something that triggers you to make discoveries, indulge in investments or take the next advancement in life. You could be just about to take a move on a certain idea, but some conflicting messages keep coming to your mind, and you get discouraged. This card resembles your inner battles which are preventing you from expressing your heroism to the world, to let the world know that you exist for a reason. If you are wise enough, this card is normally a trigger of courage. It should make you overcome the personal discouragements and move forward boldly to launch your ideas in the real world. Remove the fear, gather your resources and do something. Let the world know that you are there and you have no jokes about moving forward in the path that you choose. Conquer every obstacle, let your ideas shine and be known to the world because this card indicates a level of success that can only be achieved when courage is deployed. 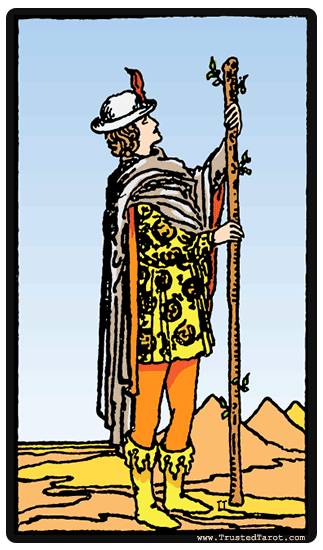 With the Page of Wands reversed, it tends to emphasize the more negative character traits of the upright version. He tends to show up when your mind is filled with one great idea after another, and are unable to progress beyond the beginning planning stages. Perhaps you have started a project or a hobby expecting that it would grow to great levels and instead you end up nowhere. As painful as it is, it is a good way of telling you that you should venture into other meaningful projects and avoid wasting time.